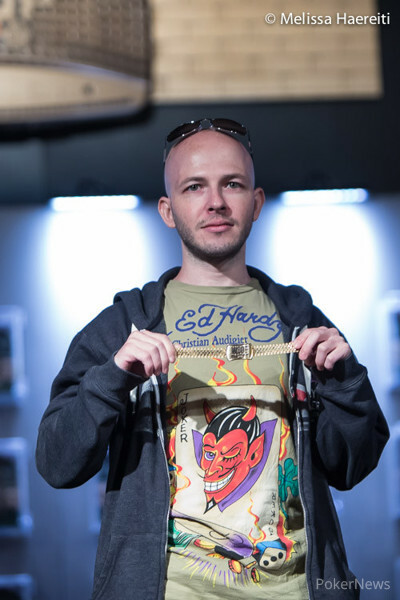 Alex Bolotin knows what it's like to win in the Amazon Room - he took down the 2009 Ante Up for Africa Charity Event - but prior to 2014 he had never had the honor of sliding a WSOP gold bracelet on his wrist. 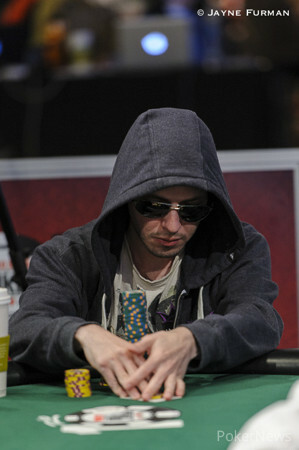 In 2007 he finished runner-up to Bill Edler in a six-handed event, and he also reached final tables in 2006 and 2008. That all changed on Sunday, as he defeated 2013 PokerStars Caribbean Adventure Main Event champion Dimitar Danchev heads up to bank $259,211 and that elusive gold bracelet. The Belarusian was all smiles after the win, and is quite proud of his European heritage - prior to this win he sat atop the all-time Belarusian money list, and now with over $2.4 million in earnings he's extended his lead on Vadim Kursevich to over $400,000. Bolotin hit a very big two-outer against two-time WSOP bracelet winner Josh Arieh during four-handed play, spiking an ace for a set after getting all of his chips in the middle with an overpair against a flopped set of tens. On the final hand, the Bulgarian grinder attempted an all-in river bluff with just queen high. Bolotin tanked for a considerable amount of time before calling with top pair, and Danchev acknowledged the skillful call. The two exchanged a handshake and brief pleasantries, then Danchev was off to the cage to collect his first six figure score since the 2013 PCA. He, like Bolotin, leads his home country in all-time earnings with over $3.2 million. The final day of this shootout event started with 12 players, including two-time WSOP bracelet winner Josh Arieh, bracelet winner Steven Loube, and Maxx Coleman and Jon Lane, who both made deep runs in the 2013 WSOP Main Events. Recent WPT winner Jared Jaffee and Steven Geralis both exited before the unofficial final table, and Colin York was bounced on the official final table bubble. Coleman lost a race with ace-queen suited against Arieh's pocket jacks, exiting in ninth place, and then Arieh recorded a double elimination. All of the money went in preflop, with David Trager holding a pair of sevens, Shawn Busse ace-jack, and Arieh ace-queen. The flop changing nothing, but Arieh made a pair of queens on the turn, and the river was a blank. Arieh recorded a fourth knockout at the final table, eliminating Douglas Foster in sixth place, and Steven Loube ran into the pocket queens of Boloton to bust in fifth place. Arguably the most important hand of the tournament came in Level 4, and it led to Arieh's demise. He had Bolotin all in and at risk for nearly half of the chips in play with a set of tens, and Bolotin was drawing to two outs or running straight cards with pocket aces. The spiked down on the turn, giving him a set of aces, and the river was a brick. Ten hands later, Arieh hit the rail after getting all of his chips in the middle with two pair against a made flush. The two-time bracelet winner failed to fill up on the river, and was eliminated. Three-handed play lasted roughly two hours, and it took a cooler to eliminate Lane. Danchev flopped a set of deuces against Lane's pocket aces, and all of the money went in the middle. Neither the turn nor the river improved Lane's hand, and he was off to the cage to collect $100,239. Heads-up play lasted a total of 87 hands, and Bolotin never relinquished the chip lead. While Danchev was min-raising on the button and three-betting to smaller amounts, Bolotin was constantly raising to three-times the big blind, and three-betting quite large. 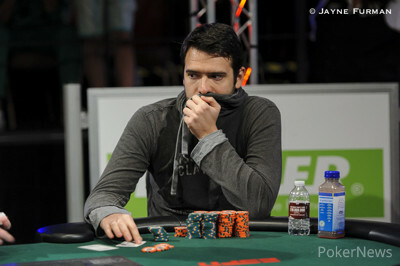 On the final hand, Bolotin three-bet to 150,000 over an open to 50,000 from Danchev. Bolotin tossed out a continuation bet on a king-high flop, then opted to check-call a bet on the turn and then an all-in bet on the river. Danchev tabled total air, and Bolotin revealed a king in order to capture his crown. 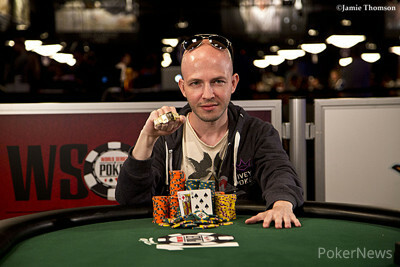 Congratulations to Bolotin for the win, his second at the WSOP and his first in a bracelet event. Be sure to follow our continuos coverage of the 2014 World Series of Poker right here on PokerNews.com! Dimitar Danchev Eliminated in 2nd Place ($160,410); Alex Bolotin Wins! Hand #209: Dimitar Danchev raised to 50,000 from the button only to have Alex Bolotin three-bet to 150,000 from the big blind. Danchev paused for a few moments before making the call as the dealer spread a flop. Bolotin continued for 175,000 with Danchev make a rather quick call as the landed on the turn and Bolotin checked to the Bulgarian. Danchev paused, and then cut out a bet of 236,000 which Bolotin called before the dealer delivered the on the river and Bolotin checked once more. Danchev looked down at his stack, and then announced he was all in with Bolotin quickly asking for a count. The dealer cut down Danchev's stack and it amounted to 594,000. Bolotin removed his hood and sunglasses went deep into the tank for close to two minutes before announcing a call. Danchev flipped over his for a queen-high bluff as Bolotin tabled his for top pair and the bracelet as Danchev was left to take 2nd place and the $160,410 in prizemoney. Hand #205: Dimitar Danchev opened to 50,000 and won the big blind and antes. Hand #206: Alex Bolotin opened to 72,000 and Danchev called to see a flop with Bolotin betting 75,000 and Danchev calling. The turn landed the and both players checked to see the . Both players again checked and Danchev tabled his to win the pot. Hand #207: Danchev raised to 50,000 and won the big blind and antes. Hand #208: Bolotin raised to 72,000 and won the big blind and antes. Can Alex Bolotin capture his first bracelet? Hand #199: Dimitar Danchev was on the button and raised to 50,000. Alex Bolotin casually flipped in a call, then checked on a flop of . Danchev continued for 60,000, Bolotin check-raised to 185,000, and Danchev folded. Hand #200: Danchev received a walk. Hand #201: Danchev popped it up to 50,000 on the button, Bolotin called, and the dealer fanned . Bolotin checked, Danchev bet another 50,000, and Bolotin once again check-raised - this time to 165,000. Danchev folded. Hand #202: Bolotin raised to 72,000 on the button, Danchev three-bet to 205,000, and Bolotin folded. Hand #203: Bolotin received a walk. Hand #204: Bolotin bumped it up to 72,000, Danchev committed enough chips to make the call, and the flop came . Danchev checked before the dealer revealed any of the community cards, Bolotin fired out 77,000, and the 2013 PCA Main Event champ called. The turn was the , Danchev knuckled again, and Bolotin bet 150,000. Danchev folded. Hand #191: Dimitar Danchev raised to 50,000 and won the big blind and antes. Hand #192: Alex Bolotin raised to 72,000 and won the big blind and antes. Hand #193: Danchev raised to 50,000 and won the big blind and antes. Hand #194: Bolotin raised to 72,000 only to have Danchev three-bet to 180,000 to force a quick fold from Bolotin. Hand #195: Dimitar Danchev raised to 50,000 and won the big blind and antes. Hand #196: Danchev received a walk in the big blind. Hand #197: Danchev raised to 50,000 and won the big blind and antes. Hand #198: Bolotin raised to 72,000 and Danchev made the call to see a flop with both players checking as the landed on the turn. Danchev bet out 80,000 and Bolotin called as the completed the board on the river. Danchev pushed out 205,000 and Bolotin instantly called tabling his to best Danchev's . Hand #186: Alex Bolotin had the button and raised to 72,000. Dimitar Danchev quickly called, then checked dark prior to the flop coming . Danchev led out for 100,000 on the turn ( ), and Bolotin folded. Hand #187: Danchev raised to 50,000, Bolotin called, and the flop fell . Bolotin check-called a bet of 60,000, the turn was the , and Bolotin checked again. Danchev pushed out a bet worth 282,000, and Bolotin tank-folded. Hand #188: Bolotin reached for raising chips, and Danchev folded before he could even commit them. Hand #189: Danchev raised to 50,000 with the button, Bolotin called, and the dealer fanned . Bolotin checked, Danchev continued for 60,000, and Bolotin check-raised to 185,000. Danchev instantly mucked. Hand #190: Bolotin raised to 72,000 on the button, and Danchev folded. Hand #180: Alex Bolotin raised to 72,000 and Dimitar Danchev folded. Hand #181: Danchev opened to 50,000. Hand #182: Bolotin opened to 72,000 and Danchev made the call as the flop came and Bolotin's bet of 80,000 was enough to take it down. Hand #183: Danchev opened to 50,000 and Bolotin made the call to see a flop. The action was checked round to see the , and with it Bolotin bet out 60,000. Danchev called as the river fell the before both players checked with Bolotin tabling the to take the pot down. Hand #184: Bolotin opened to 72,000 and Danchev three-bet the big blind to 205,000 to force Bolotin to fold. Hand #185: Bolotin received a walk in the big blind.